In the early Romaniote Rite the Torah was subdivided in Sedarim while the whole Torah was read in the Palestinian way of the Triennial cycle. The order for reading the Haftarah followed an own custom. The Romaniote Torah scrolls are housed in "tikim" ('tik', from Greek 'thekai' „container“), where they never are taken completely out. Among the Romaniote Jews, tradition dictates, that the most holy Sefer Torah, the Law of Moses, be read with the scroll standing upright in its tik; it is considered improper to lay it flat. The siddur (prayer book) for the Romaniote rite was known as the Mahzor Romania. It was actually the first Mahzor and represented the Minhag of the Byzantine Jews which is the oldest European Prayer rite. Later the first Mahzor was printed, the Mahzor Bene Roma, which was based on the Romaniote Mahzor. The Romaniote Jews have their own form of wedding blessing. Upon the betrothal, seven blessings are bestowed on the bride and groom to be, while wedding wreaths are covering the heads of the groom and the bride and are interchanged on their heads. At the end of a full year, the Ketubah was read at the wedding ceremony proper. This is different in that other Jews bless the bride and groom at the time of the actual wedding. In addition, there are ritual differences in the building of the Synagogue and in the building and the use of the mikve. It is a Romaniote tradition to write on the Ketubah the year since creation of the world and the year since the destruction of the Temple. The Romaniotes traditionally gave to a child a mystical document known as an "Aleph". This hand-painted "birth and circumcision certificate" was created by a family member and then handed down. The aleph was written in mystical codes for the purpose of warding off the wiles of Lillith, Adam's first wife. The Romaniotes are well known for their hymns in Judeo-Greek and Hebrew, for their special way of cantillation, based on the Byzantine melos and for their Jewish-Greek folksongs, based on regional melodies. 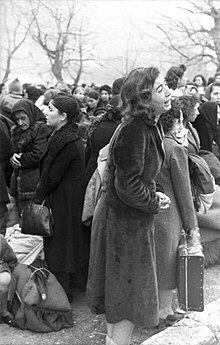 Jewish immigrants from Sicily brought to Ioannina the celebration of the Sicilian Purim Katan. The Jews of Ioannina call this holiday "Pourimopoulo". They read the special "Megillah for the Purim Katan of Syracuse" and sing corresponding songs and hymns for this festivity. The Mahzor of the Romaniote Kaffa Rite from the year 1735 gives the order to read the Megillat Antiochos in the Mincha of Shabbat Hanukkah. In the second half of the 19th century, the Romaniote community of Greece made an effort to preserve the Romaniote liturgical heritage of Ioannina and Arta, by printing various liturgical texts in the Hebrew printing presses of Salonika. Today, the Romaniote Liturgy follows (with slight differences) the mainstream Sephardic usage, while the Romaniotes and the Jews of Corfu have preserved their old and own Judaeo-Greek and Hebrew piyyutim, their own way of cantillation and their special customs. A custom is, which is still followed in the Etz Hayyim Synagogue of Crete to read on Yom Kippur the Book of Jonah in Judaeo-Greek. Another custom was to chant the Song of Songs verse by verse by alternating from Hebrew to its paraphrasing Targum Jonathan-translation after the morning service on the last two days of Pessach. Romaniote Synagogues have their own layout: the Bimah (where the Torah scrolls are read out during services) is on a raised dais on the western wall, the Aron haKodesh (where the Torah scrolls are kept) is on the eastern wall and in the middle there is a wide interior aisle. Votive offerings made of silver as stars or tablets called "Shadayot" were a thankful gift to the Synagogue of congregants who have received help, healing or salvation by God. The Romaniote Term for the Passover ceremony (Seder) is "חובה/Hova", which means obligation. The Jewish Museum of Greece published in 2004 a Romaniote rite Pesach-Seder CD (The Ioannina Haggadah (CD)). In the years 2017 and 2018 the Romaniote rite Haggadah and the Romaniote rite Prayer book (Siddur) have been published in a series, containing also Romaniote poetry, the Haftarot according to the Romaniote custom and other texts.